Mental illness is a hard thing. We don't understand enough about it and so we fumble around (with good intentions) trying to support and stabilize people who face a darkness that those of us don't suffer can only guess at. As terrible as these disorders are for those who live with them, they are also terrible for those who love someone living with mental illness. It takes a toll on everyone. 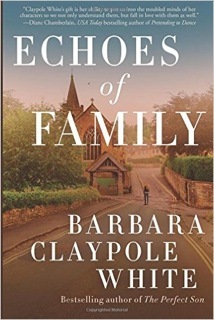 Barbara Claypole White shows the effects of bipolar disorder on one woman, the family who loves her, and an old friend she once betrayed in her newest novel, Echoes of Family. Marianne Stokes runs a successful recording studio in North Carolina with her husband Darius. She started a group called Girls in Motion to help runaway girls find a home in music although she's since passed control of the group to the daughter of her heart (and a former member of the program), Jade. Marianne is a creative and empathetic person. She is also bipolar. After she is involved in an accident that results in a stillbirth, she is driven to go back to the small village in England where she grew up to face the accident in her youth that left her lover and her unborn baby dead and seriously injured her best friend and first love. She tells no one that she is going, leaving Darius and Jade to handle the business and to worry about Marianne's well being and whereabouts. Initially unable to face the cemetery she feels drawn to visit, Marianne finds herself in the village church being awakened by her long lost best friend, Gabriel, who happens to be the village vicar. Although he hasn't forgiven Marianne for her long ago betrayal, he offers her a place to stay as she faces her demons. What he doesn't know is that Marianne has decided to go off of her meds and this will push his forbearance to the very limits. Meanwhile, Jade and Darius have tracked Marianne down and are trying to do what is best for her but also support Gabriel in his caretaking even as Darius in particular is fighting with his jealousy toward this man who has a long and complicated past with his wife. As Marianne spirals into a manic phase, the chapters centered on Marianne become more and more frenetic, mimicking the out of control disorder of her very thoughts. Other chapters center on Gabriel, Jade, and Darius and the struggles they face in their own lives and in caring for a Marianne in crisis. Obviously her disorder is a large part of Marianne but there are many other drawings of her personality as well. She wants to protect those she loves from herself and her demons and as a caretaker, she wants to save and nurture those struggling around her even as she needs to heal herself. She carries impossible loads of guilt for the accident so many years ago that cost Simon's life, her unborn baby's life, destroyed her friendship with Gabriel, and drove her to a psychotic break. Never having told all of the details from that night to anyone else, she has been unable to find forgiveness. She is not the only one who needs to finally face up to the truth of that terrible tragedy though. Gabriel too needs to find forgiveness and come to peace. Although Marianne is the central focus of the novel, the other major players, Gabriel, Jade, and Darius, are all the focus of chapters as well. This helps show the impact that loving someone who is mentally ill has on those around that person, the various different ways people react, and the depth to which they are affected. Marianne is a force of nature, both on and off her medication, and she inspires great loyalty from those around her. Gabriel is a little bit cliched: the attractive vicar who tends his flock (and Marianne) with only occasional apologies to God for not always thinking the best of people. Despite this, he is quite a likable character and towards the end once he starts to face his own demons from that long ago accident, he becomes a much more complete character. Given he is still devastated by Marianne choosing his brother Simon over him, it isn't entirely understandable why he takes Marianne in and wants to protect her after so many years though. Darius isn't all that well fleshed out beyond being a jealous and potentially volatile spouse. And Jade, the constant voice of reason, never quite connected for me. Perhaps, as Darius feared, the story was always the Marianne and Gabriel story for me and the others were rather incidental. This is clearly a sensitive, nuanced, and understanding look at mental illness, bipolar disorder in particular, but it is also about guilt and forgiveness, loss and understanding. It is about the ways that the past shapes all of us, the ways we carry it with us always, and the necessity of coming to peace within ourselves with all of it. For more information about Barbara Claypole White and the book, check out her website, like her Facebook page, or follow her on Twitter. Also, check out the book's Good Reads page, follow the rest of the blog tour, or look at the amazon reviews for others' thoughts and opinions on the book. Reading it now, and enjoying it. The vicar sounds like a character I'd enjoy getting to know, among other reasons to read this book!